Very easy and a sure hit ! Brown chicken in oil in a large fry pan. Drain excess oil. Stir in remaining ingredients. Reduce heat. Cover, and simmer 35-40 mins. until tender. If desired, serve chicken pieces with sauce over rice or spaghetti. Thanks for sharing the recipe. Chicken cacciatore is simply delicious - a great family recipe! Hi I am a new follower from Wobble Over Wednesday! OMG! Chicken Cacciatore is our favorite! We are so excited to have found you on Welcome Wed.! Hi! We're a happy new follower from Welcome Wednesday. Hope you're having a great week. Follow us too if you like what we've got goin' on! We also have a cool giveaway, as we speak! Looks like a great recipe! I love your knitted items too! New gfc follower from Bassgiraffe's blog hop! Following you through Thursday Blog Hop. Check us out too! 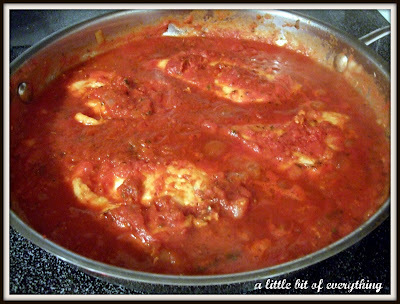 This chicken cacciatore is right down my alley,looks like the recipe my mother used to make. Thank looks delicious and I just adore your plate. That looks delicious! and easy. I will be trying it out. looks amazing! cacciatore is one of my favorites. 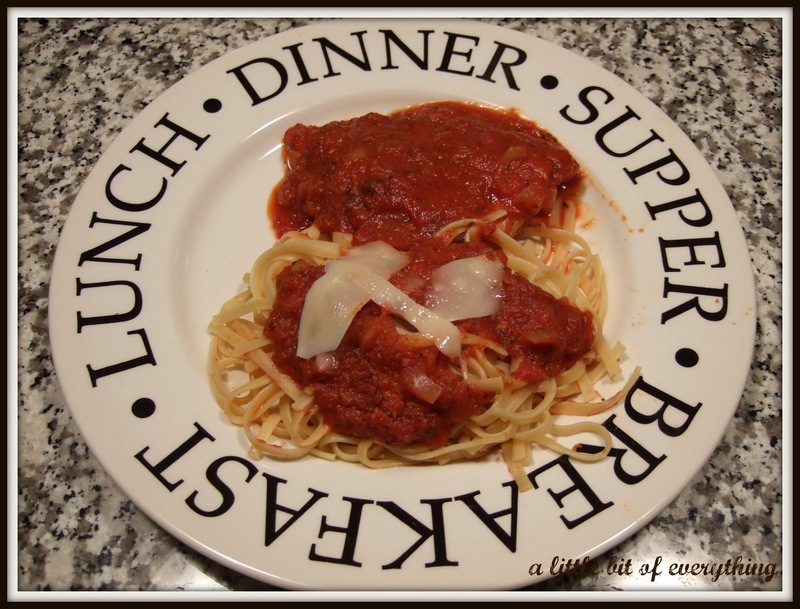 thank you for sharing this great recipe with tuesday night supper club! This recipe looks delicious and easy. It's now on my list for next week's menu. Dropping by from FCF to check out your yummy looking recipe. I'm all for easy and tasty recipes, and this seems to fit the bill. Looking forward to trying it. I love chicken cacciatore. Such great flavors. Thanks for sharing with Fat Camp Fridays, hope to see you back next week with another great recipe! this is one of my favorite dishes....yours looks delish! Looks delicious! And we have the same china. LOVE IT! Mmm love a new recipe. Thanks for sharing and Thanks for linking up to Topsy Turvy Tuesday's! Yum this sounds and looks SO good! Looks perfect! My father in law is coming to visit, he would love this. I haven't made this in years! I found you through Lamb Around! I love this recipe! I can't wait to try it! I'm happy to be a new follower! Oh yum! that looks delish! I found you rom Forty and Over Blog hop, I followed, would appreciate a follow back! This chicken recipe from pillsbury is one of the lovely and recipes for dinner easy recipes for dinner.